Therapeutic Respiratory Devices Market size is set to exceed USD 21.5 billion by 2024; according to a new research report by Global Market Insights. Rising prevalence of chronic respiratory and pulmonary diseases such as asthma, chronic bronchitis and chronic obstructive pulmonary disease (COPD) will accelerate the market growth during the forecast period. According to World Health Organization, around 251 million cases of COPD were recorded globally in 2016. Growing number of COPD cases coupled with rising COPD mortality will fuel the demand for therapeutic respiratory devices for treatment of aforementioned respiratory diseases thereby augmenting the market growth. Increasing geriatric population base across the world will serve to be high impact rendering factor. According to UN estimates, the global elderly population aged 60 years and above is set to reach over 2.1 billion by 2050 from over 962 million in 2017. Increase in prevalence of pulmonary and respiratory diseases is high among elderly population. This is attributable to changes in pulmonary function of the elderly due to structural changes with age, changes in gas exchange as well as ventilatory response. Innovation in therapeutic respiratory devices leading to development of easy to use, smart and high efficiency respiratory devices will drive the market growth over the forecast period. For instance, ResMed developed AirMini CPAP device, the smallest portable CPAP device that offers effective waterless humidification for portable convenience and can be controlled with the AirMini app. Adoption of such devices for treatment of various respiratory devices is increasing globally thereby accelerating the industry growth during the forthcoming years. However, lack of patient adherence to the treatment will impede the industry growth during the forecast period. Difficulty experienced during use of respiratory devices, especially in the geriatric patients owing to physical limitations could restrict the use of these devices. Moreover, high cost burden of respiratory devices will impact the market growth to a certain extent. Inhalers segment of therapeutic respiratory devices market is expected to grow at a robust CAGR of 7.6% during the forecast period owing to rising prevalence of chronic respiratory diseases worldwide such as COPD, asthma and lung cancer. According to World Health Organization, in 2017, around 235 million people worldwide suffered from asthma. Moreover, numerous advantages offered by inhalers such as short administration & preparation time, fewer irritant effects and ease of use will fuel the demand for inhalers during the forecast period thereby augmenting the therapeutic respiratory devices market growth. Hospitals segment accounted for the largest market share with a revenue of USD 4.3 billion in 2017 and is likely to remain so during the forthcoming years. This is attributable to advancements in healthcare infrastructure coupled with increasing healthcare spending owing to rise in disposable income. Furthermore, ability of hospitals to buy high-cost instruments and availability of trained hospital staff for operating inconvenient respiratory devices will further boost the segment growth over the forecast period. U.S. dominated the North America therapeutic respiratory devices market accounting for more than 80% of regional market share in 2017 and is expected to witness lucrative growth over the forecast period. This is attributable to the highly advanced infrastructure to support therapeutic respiratory devices and technological advancements in the region. 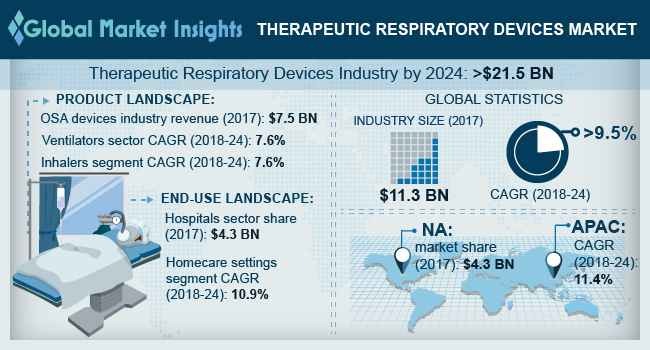 Most of the major players in the therapeutic respiratory devices market operate in the U.S. High demand for technologically advanced devices coupled with high affordability will augment the regional growth during the forthcoming years. India therapeutic respiratory devices market is expected to witness around 12% CAGR over the coming years. This is attributable to factors such as rising prevalence of respiratory diseases, growing disposable income, escalating investments in healthcare infrastructure and growing patient awareness regarding early diagnosis and treatment of respiratory diseases. Some of the notable industry players operating in global therapeutic respiratory devices market are Aircep Corporation, Breas Medical, CareFusion Corporation, Compumedics, Fisher & Paykel, GE Healthcare, Hamilton Medical, Hill-Rom, Inogen, Invacare, Medtronic, Mindray Medical, Philips Healthcare, Resmed, Smiths Medical and Teleflex. Key strategy adopted by most of the dominant industry players include mergers, partnerships and acquisitions to strengthen product portfolio and maintain their market position. For instance, in June 2014, Medtronic acquired Covidien, a global healthcare technology and medical supplies provider, with an aim to diversify product portfolio and broaden its geographic reach.